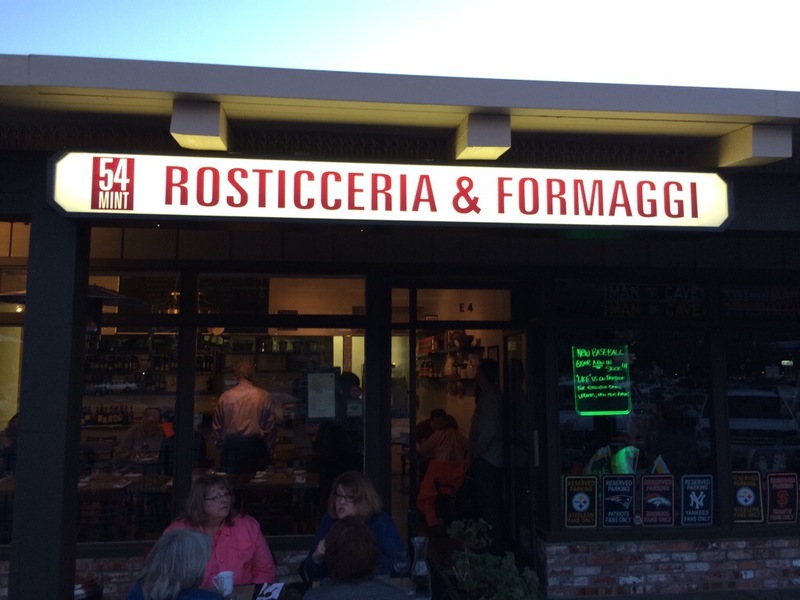 Last weekend my wife and I had a date and went to our favorite Italian restaurant in the east bay 54 Mint. It’s located in a nondescript strip mall in Concord that also houses a Trader Joes and several other small shops and restaurants. From the outside the restaurant may be non-descript but once you walk in you feel like you’re at home in this very simple but elegant place. Concord is not a bastion for foodies, but in this case it has lucked itself into a little gem that can stand up to the big boys. This is actually a second location for this restaurant with the other one located in San Francisco’s in Mint Plaza, hence the name. When we get a chance to go out without the little princess this is usually where we end up. This small but well know spot has less than 40 seats inside and maybe 12-15 outside under a covered patio. When you decide to make the trek out here be sure to make a reservation because with so few seats there can be a wait even at 6 PM on a Saturday. We’ve seen them do their best to accommodate walk in’s but if you have a party larger than two do yourself the favor and call ahead, you’ll thank me later. 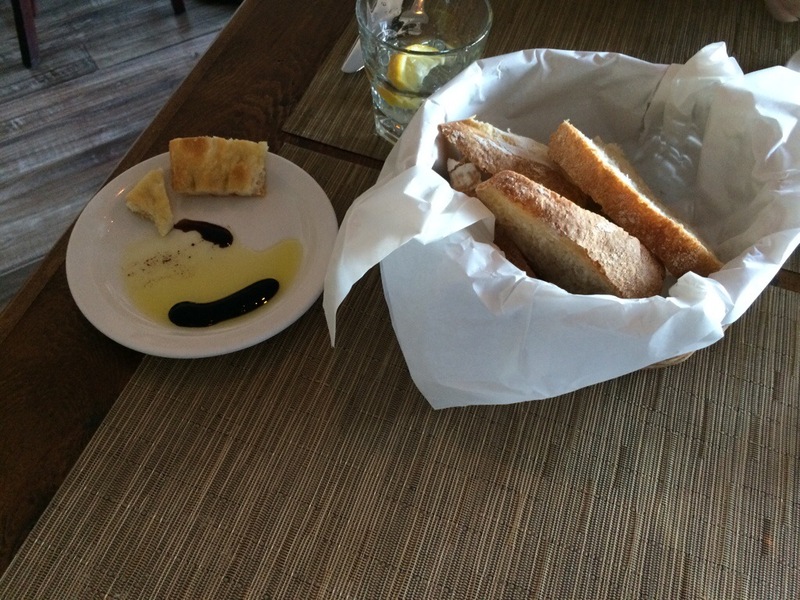 We started out with the house focaccia, and as usual it was excellent I had to have mine with olive oil and balsamic vinegar. 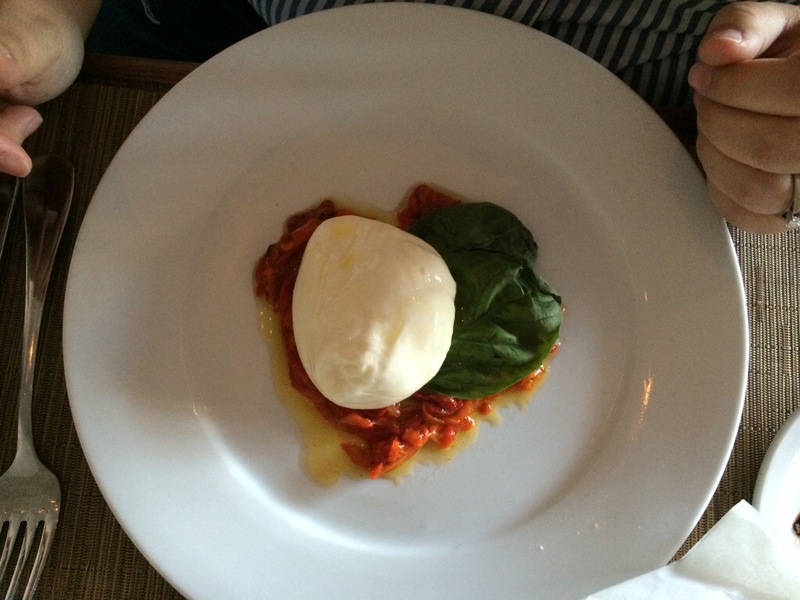 My wife her tired and true dish Burratta and marinated red peppers with olive oil and basil. This dish is freaking delicious and my mouth is watering just writing about it. The cheese is just so fresh and tasty, which is amazing since I found out on this visit it’s imported from Italy. As for my appetizer I started with a new dish, it was not on the menu three months ago when we went last. 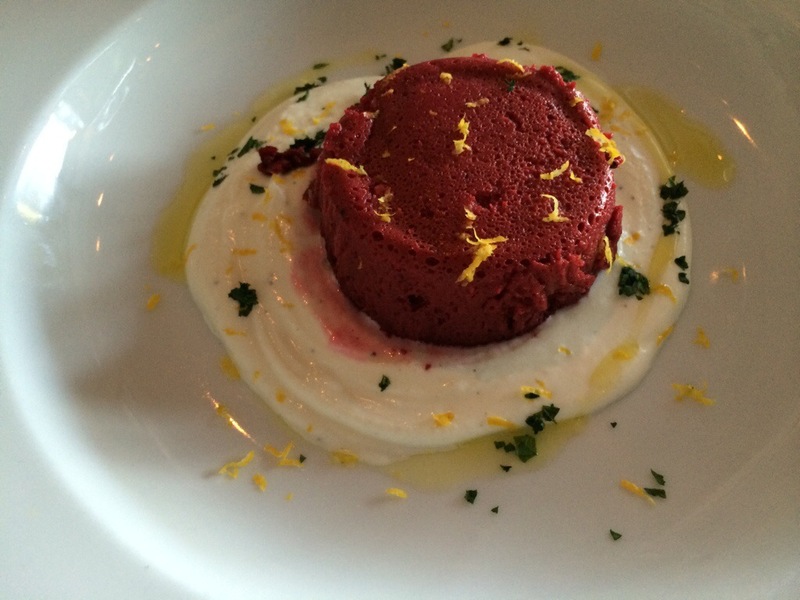 I had the beetroot flan over whipped creamy goat cheese with a little bit of olive oil and lemon zest. I love beetroot and in this different preparation it was damn fantastic. It was light and airy and just tasted great. 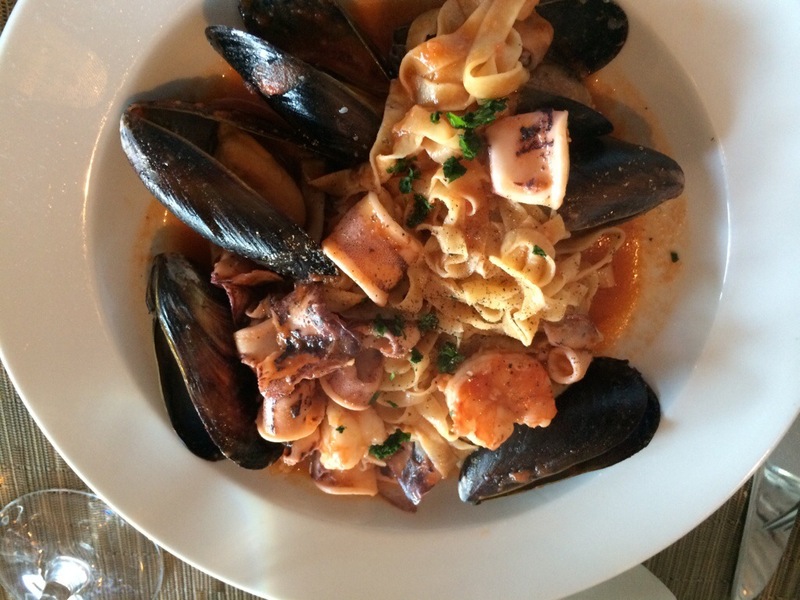 For my entre I had the house made linguini with seafood and a light tomato sauce. The dish included mussels, shrimp and calamari. The linguini was perfectly cooked and just slightly aldente. My wife again struck gold with her choice also a house made pasta. 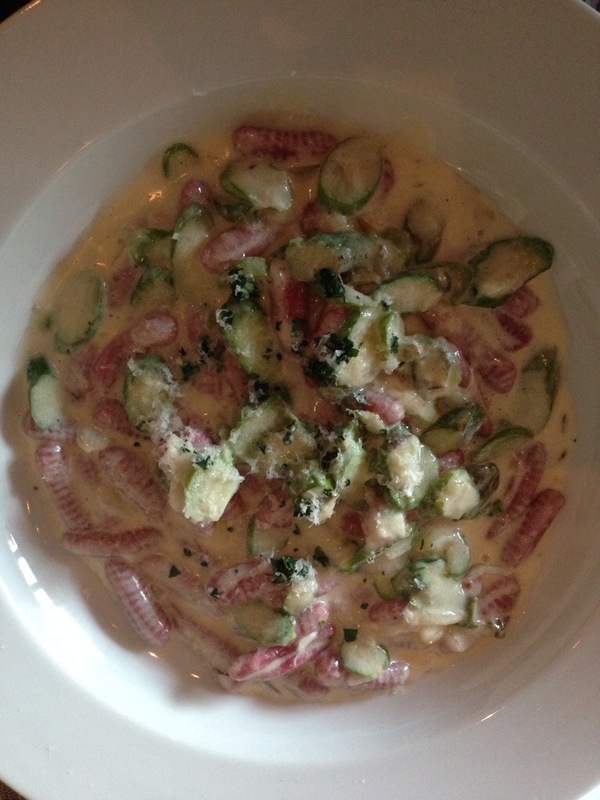 In this case, it was a beetroot cavatelli with parmesan cream sauce and tender asparagus rounds. Except for the fact that the pasta looked like little larvae, it was extremely amazing. If my wife had turned away or left the table for any reason I would have eaten her whole dish. 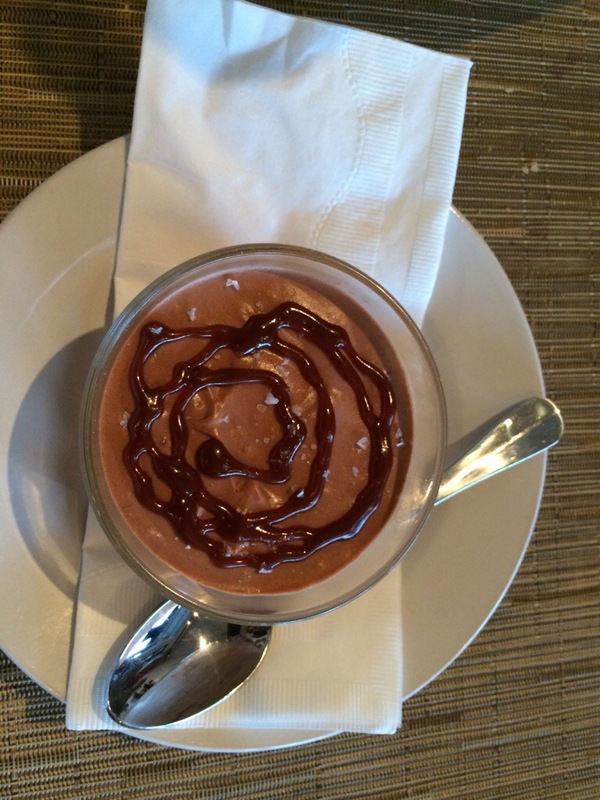 For desert we got our usual the chocolate mousse. In this case it also had a caramel sauce with sea salt. Why didn’t we share, because it’s just so good I just can’t do that. Let’s be honest there are times when you’ve had a dish that’s so good, and you just can’t share. And this is one of them. One warning it’s pretty rich so although you should share it, save half for breakfast the next day like I did. Why do we like 54 Mint. It’s just one of those places that you love going to. They have really great food, the staff are friendly and you’re treated well. We’ve only been here a dozen times over the past three years, but the staff know us and make us feel welcome every time, even though we’re not regular. So next time you’re coming to the east bay make sure you check out 54 Mint.